The global water-soluble fertilizers market is estimated to be valued at USD 12.24 Billion in 2016 and projected to reach USD 17.06 Billion by 2022, at a CAGR of 5.69% from 2016. With the increase in demand for food security for the growing population, along with the limited agricultural land available in the world, and rise in crop loss due to nutrient deficiency, the use of water-soluble fertilizers is expected to enhance the market growth. The global market has been segmented on the basis of type, crop type, and mode of application. It has been further segmented on the basis of region into North America, Europe, Asia-Pacific, and Rest of the World (RoW). 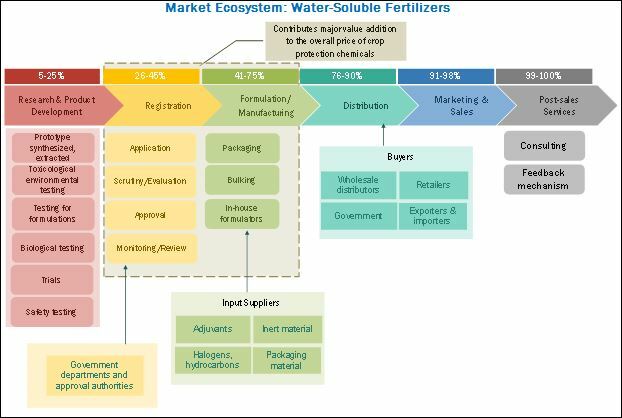 The main objectives of the report are to define, segment, and project the size of the global market for water-soluble fertilizers, with respect to the above-mentioned segmentations and to provide a detailed study of key factors influencing the growth of the market, along with profiling the key players in the market and their core competencies. This report includes estimations of market sizes for value (USD million) with the base year as 2015, and forecast period from 2016 to 2022. Top-down and bottom-up approaches have been used to estimate and validate the size of the water-soluble fertilizers market and to estimate the size of various other dependent submarkets. Key players in the market have been identified through secondary research such as company websites, company press releases, the Food and Agriculture Organization (FAO), the International Fertilizer Industry Association (IFA), the International Fertilizer Society (IFS), and the International Plant Nutrition Institute (IPNI), and their market share in respective regions has been determined through primary and secondary research. All percentage shares, splits, and breakdowns have been determined using secondary sources and were verified through primary sources. On the basis of type, the water-soluble fertilizers market is led by the nitrogenous segment, followed by the phosphatic, potassic and micronutrients segments, respectively. The nitrogenous segment is projected to be the fastest-growing type in the water-soluble fertilizers market, due to the high crop loss by nutrient deficiency and high efficiency of nitrogenous water-soluble fertilizers to reduce this crop loss. Water-soluble fertilizers are used on all crop types, the ones considered in the study are horticultural crops, field crops, turf & ornamentals and others, which include plantation crops and hydroponics. The market for horticultural crops is the highest and is also projected to be the fastest-growing. This is mainly due to a high demand for fruits & vegetables by the growing population across the world. The different mode of applications for water-soluble fertilizers are foliar, and fertigation. Fertigation is highly used for applying water-soluble fertilizers. To improve fertility and increase productivity of plants, fertigation is effectively used to control nutritional deficiency. The increasing acceptance of micro irrigation and precision irrigation techniques has proven to be a major driving factor for the fertigation application. In 2015, Europe accounted for the largest market share in the water-soluble fertilizers market, followed by North America and Asia-Pacific. Russia and Spain constituted the largest country-level markets in the European region in 2015. Increase in awareness about the benefits of water-soluble fertilizers, among the cultivators and rise in population is leading to the growth of the market in this region. The water-soluble fertilizers market in the Asia-Pacific region is projected to grow with investments from several multinational manufacturers. The market is projected to grow because of the increase in agricultural technologies and agricultural exports of key products. Moreover, extensive R&D initiatives have been undertaken for exploring the new varieties of water-soluble fertilizers to be used on different nutrient deficiencies and soil fertility to increase the yield. Factors such as growth of organic fertilizer industry and high cost of water-soluble fertilizer leading to rise in agricultural cost of production are restraining the growth of the market. Key players identified in the global water-soluble fertilizers market include K+S AKTIENGESELLSCHAFT (Germany), Yara International ASA (Norway), Agrium Inc. (Canada), Israel Chemical Limited (Israel), and Sociedad Quimica YMinera SA (SQM) (Chile). Most key participants have been exploring new regions through new product launches, collaborations, and acquisitions across the globe, to avail a competitive advantage through combined synergies. 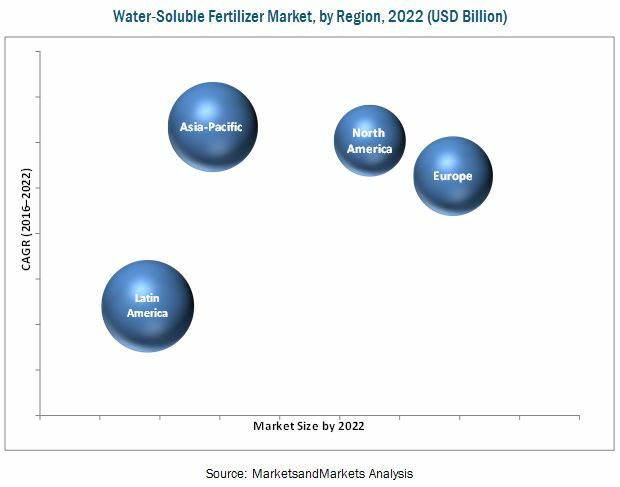 Since 2011, the water-soluble fertilizers market has witnessed an increase in demand, especially in countries such as the U.S. Canada, Spain, the U.K., India, and China. 12.10 Hebei Monband Water Soluble Fertilizer Co., Ltd.
Table 1 Estuaries With the Problem of Eutrophication in the U.S.